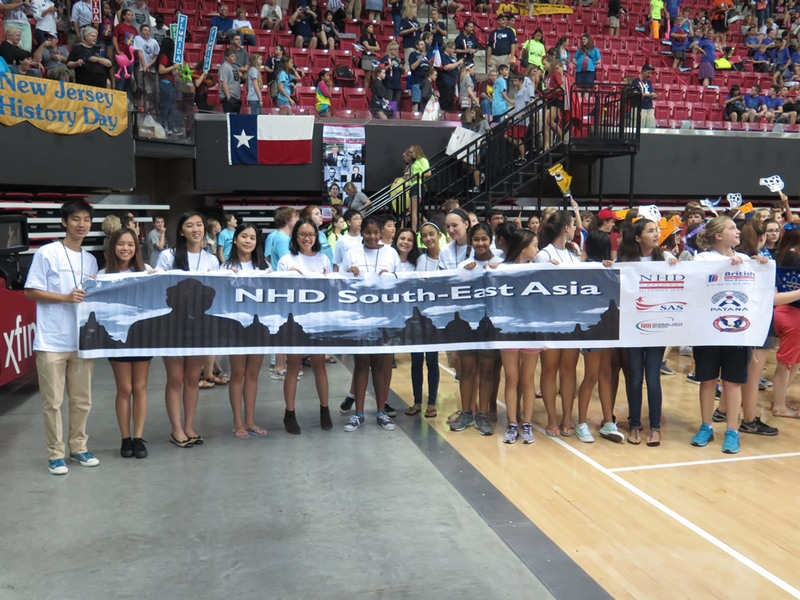 Each year hundreds of students, encouraged by teachers and parents across the South Asia region, participate in the National History Day (NHD). South Asia NHD, an affiliate of National History Day, is a highly regarded academic program for 6th through 12th-grade students. Each year hundreds of South Asia students join more than 500,000 students across the United States and internationally to participate in National History Day! South Asia NHD provides a framework for successful student projects. All students design their projects using the same annual theme and rule book. Students choose historical topics related to this annual theme, and conduct extensive primary and secondary research at libraries, archives, museums, historic sites, and more. Projects are not limited to any particular time period or geographic area. Indeed, students can pick topics related to US history or any other type of history they are interested in researching. After analyzing and interpreting their source material, students create a plan to present their findings to their peers and teachers before moving on to the affiliate and possibly national contests. Students can create and present original research papers, exhibits, performances, websites, and documentaries. Each of the categories, except papers (which are done by individuals only), can be created by a group of two to five students, or by an individual. In the spring, students may enter their work into the affiliate contest where it will be judged by educators, professors, museum staff, and historians. If their work is chosen as one of the top two projects in their category, they will be eligible to attend the National History Day Contest at the University of Maryland at College Park in June. 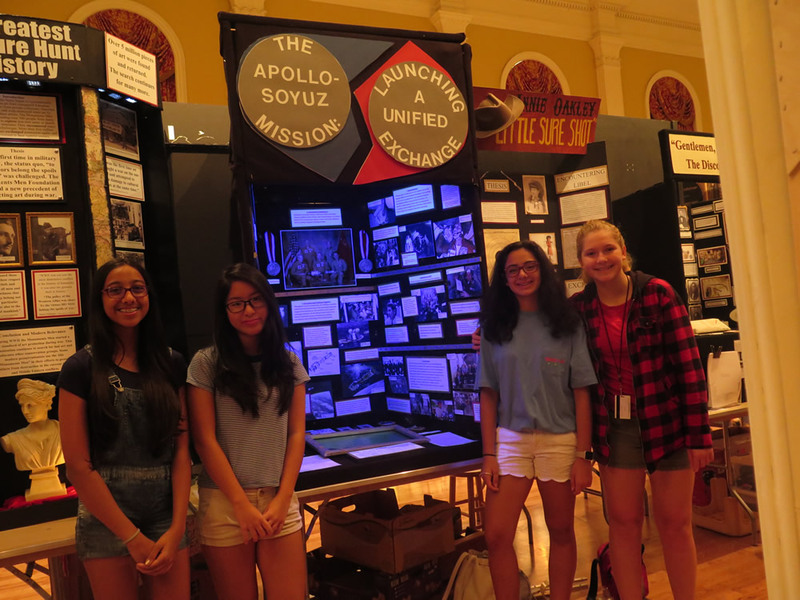 This is where the best National History Day projects from across the United States, American Samoa, Guam, International Schools of Asia, and Department of Defense Schools in Europe all meet and compete. NHD provides a framework for success. It teaches essential skills, boosts performance, prepares students for college, and inspires participants to do more than they ever imagined they could. But you don't have to take our word for it. Check out the National History Day Works program evaluation and see for yourself what NHD does for our South Asia students. The South Asia NHD Affiliate Final is an annual competition in which students demonstrate their knowledge of history through papers, performances, documentary presentations, websites or exhibits. If students place 1st or 2nd at the affiliate level in their category, they can compete against students from all over the U.S. at National History Day in Washington, D.C.! 1. It is the responsibility of the student to comply with all NHD contest rules and regulations. This includes rules for all projects and rules specific to the category. 2. Each school within the South Asia Affiliate is currently permitted to enter 3 projects per category. Students, Please ensure that your project has qualified as one of the projects from your school. 3. Singapore American School, as the host school, is permitted to enter 4 projects into each category. All students must register individually. Complete the information as requested. Select 'New Project' or 'Link or Join Existing Project' if you're in the group category. During the registration process, please use a 10-Digit phone number. This will allow the system to move forward based on what is a US Phone number. There will be a 50.00 SGD contest fee collected for each student participant. The fee will be collected from each school and paid to SAS prior to or at the contest. Please see your NHD school coordinator regarding your fee. For the first time, the South Asia NHD Affiliate Finals will be conducting the Senior and Junior Paper Category portion of the contest remotely. Judging interviews will take place on the morning of Saturday, March 9, 2019 via Google Hangouts or Skype. Interviews for those students that still want to attend in person are welcome and encouraged. All Paper Category students MUST complete the following Google Form to complete their registration by Monday, February 25, 3:00 PM. On this form students will indicate their attendance status for the contest, how the interview will be conducted remotely, AND students will submit their final paper, annotated bibliography, any appendices as a PDF . Students are not permitted to work on their paper after the submission deadline. Once the site has been created correctly, the website address (URL) will contain an 8-Digit set of numbers. This is the Weebly ID code and it is REQUIRED to use this 8-Digit code to register for our NHD contest. Websites are due Monday, February 25, 2019 3:00 PM (Singapore Time). Once the deadline has passed, students will be locked out of the site for judging purposes. Projects that have not used the NHD WEEBLY Website Editor will not be permitted to enter the South Asia Affiliate Finals contest. FOR ALL STUDENTS IN THE DOCUMENTARY CATEGORY, PLEASE COMPLETE THE FORM BELOW TO FINISH THE REGISTRATION OF YOUR PROJECT by Monday, March 4, 3:00 PM, Singapore Time. This form only needs to be completed ONCE for a group entry. Use the form below to submit your YouTube link for the Affiliate Finals. Please make sure you have granted access to your video by making it Unlisted. By submitting the link early, students will enable the contest officials to have access and ensure the documentary is working properly for the contest. Students in this category do not need to submit their Process Paper or Annotated Bibliography until the contest on March 9, 2018. Students are permitted to continue working on their Process Paper and Annotated Bibliography. South Asia NHD DOCUMENTARY REGISTRATION. For projects in this category, SAS will provide access to electrical outlets and tables. SAS will not be able to provide iPads, screens, projectors, or laptops. For projects in this category, SAS will make electricity, tables, desks, and chairs available for performances. We will also make available two rolling racks with curtains for background or for costume changes and a portable screen for projecting. SAS will not be able to provide laptops or iPads. Singapore American School will arrange bus transport to and from the hotels listed below for students and teachers on the day of the contest, March 9, 2019. Please contact sales reps directly regarding reservations. All Paper Category students MUST complete the following Google Form to complete their registration by Monday, February 25, 3:00pm. On this form students will indicate their attendance status for the contest, how the interview will be conducted remotely, AND students will submit their final paper and annotated bibliography. Websites are due Monday, February 25, 2019 3:00pm (Singapore Time). Once the deadline has passed, students will be locked out of the site for judging purposes. Projects that have not used the NHD WEEBLY PORTHOLE will not be permitted to enter the South Asia Affiliate Finals contest. FOR ALL STUDENTS IN THE DOCUMENTARY CATEGORY, PLEASE COMPLETE THE FORM BELOW TO FINISH THE REGISTRATION OF YOUR PROJECT by Monday, March 4, 3:00pm, Singapore Time. For projects in this category, SAS will make electricity, tables, desks, and chairs available for performances. SAS will not be able to provide racks, screens, projectors, or laptops. The 2019 National Contest will be held June 9-13, 2019 at the University of Maryland, College Park. Each year nearly 3,000 students with their families and teachers gather at the University of Maryland, College Park for the week-long event. These enthusiastic groups come from all fifty United States, Washington, D.C., Guam, American Samoa, Puerto Rico, and international schools in China, Korea, and South Asia. The excitement can be felt across the campus. After spending months on project research and preparation, and competing at local and affiliate contests, these students are eager to show their hard work at the National Contest. South Asia NHD is looking for historians, educators, and others to judge student projects at this year's 2019 contest on March 9, 2019 at Singapore American School from 7:00am - 3:30pm. Simply follow the directions on the home page to register. Students in 6th through 12th grades conduct extensive research on topics related to an annual theme and present their findings in historical papers, exhibits, documentaries, performances, and websites. Judging in the Paper, Documentary, and Website categories will start on February 25, 2019 at 3:00pm. Exhibits and performances will be judged on the day of the contest, March, 9, 2019. Additionally, on March 9, from 8:00 - 12:00pm, all projects (including Paper, Documentary, and Websites) will meet with their respective judges for an interview. Evaluation and discussions with fellow judges will be a 1/2 day commitment from approximately 7:00am to 12:00pm. In return for your time and effort, we offer free parking and lunch, endless gratitude, and a positive perspective on our leaders of tomorrow. If you are confirmed as a contest judge, you will receive detailed instructions and materials to help you prepare. On March 9, 2019, the morning will begin with a judging orientation and meeting your fellow judges. Entries are scheduled at specific time intervals depending on which category you are judging. There will be a lunch break midday. Our plan is to have all projects judged before lunch. You will need to complete evaluations for each entry and submit final paperwork after your judging sessions. After the last entry in your judging group has finished, you and your judging teammates will discuss comments and ratings, and come to a conclusion about the final overall rankings for the entries in your group. * In each category, 1st and 2nd place finalists will be offered an invitation to compete in the NHD Finals in Washington D.C.
At the end of the day you will be tired, but refreshed with the spirit of youth who value history and are eager for your feedback about their year-long projects. *The process described here varies for the website, documentaries, and paper categories. If you are interested in these categories, the process will be explained to you. If you have any questions, please contact Matthew Elms, the South Asia NHD Coordinator.